Add our store to your favorites and receive exclusive emails about new items and special promotions! At SaveMyServer we put our heart into our business and stand behind our products. We want you to be satisfied. Dell PowerEdge R610 Gen I. 2 x Intel Quad Core 2.93GHz X5570 5.86GT/s 64-Bit Processors. 48GB Total; Twelve Slots Available: 12 x 4 GB DDR3 Memory Installed. Two (2) 146GB 10K SAS 2.5 Hard Drives. 6 drive bays, blanks not included. (2) PCI-Express x8 Gen2 Slots. Redundant Hot Plug Power Supplies - Power Cords Not Included. 6x 2.5 SAS/SATA Drive Bays (Blanks and Empty Tray Caddies Not Included). Two Dual Port Embedded Broadcom NetXtreme ll 5709c Gigabit Ethernet NIC. Intergrated Matrox G200, 8MB shared video memory. Dell PowerEdge R610 Perc 6i RAID Controller Card With Battery Back-Up. IDrac6 Express Remote Access Card Included. Not Included - Available In Store. Windows 2016 Server Evaluation Edition Only. Software Media or Licenses Not Included. Several - Available Upon Request. 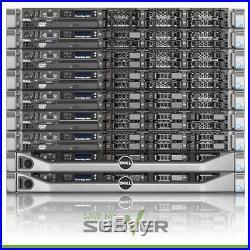 At SaveMyServer we stand behind our refurbished servers. While remarketing used servers keeps them from prematurely crowding landfills or storage, sometimes parts are broken or out-of-date. In those instances, SaveMyServer recognizes the continued need for proper disposal. Whatever we cant use, we recycle. SaveMyServer Item Information: 10EE - Eric - 16754 qid: 29123. The item "Dell PowerEdge R610 Server 2x 2.93GHz 8 Cores 48GB Perc6i RPS 2x146GB" is in sale since Saturday, December 1, 2018. This item is in the category "Computers/Tablets & Networking\Enterprise Networking, Servers\Servers, Clients & Terminals\Computer Servers". The seller is "savemyserver" and is located in Suwanee, Georgia. This item can be shipped to United States.